Window Treatments are incredibly important to any interior. They soften the hard surfaces, draw the eye upward, frame out the view, and add color and texture…providing tremendous impact on a room’s ambiance! Hello again! 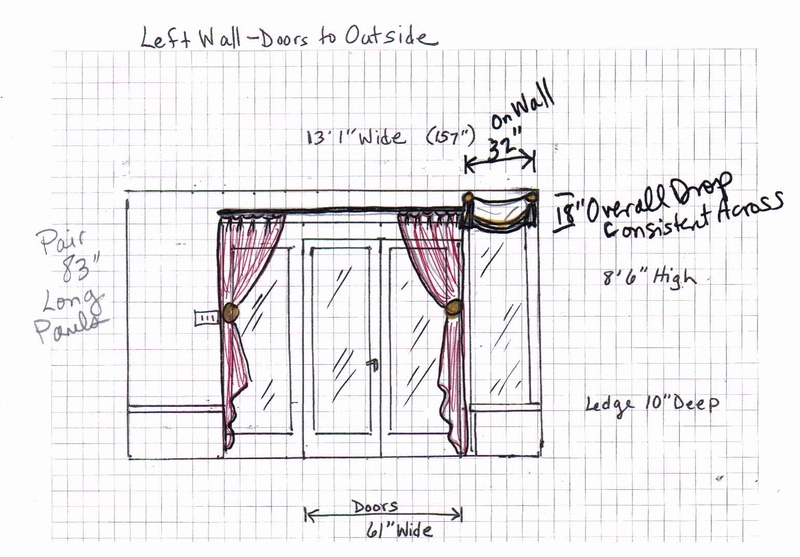 Today we’ll be discussing the window treatments I have planned in my Bucks County Designer House Sunroom Project. Since this room is FULL of lovely windows (15 to be exact), this is a super important (and expensive) piece of my design. Many designers choose to leave windows un-adorned in a sunroom, and that look is appropriate at times, but I think this room feels a little cold and harsh with nothing on the windows. You’ll also recall the less-than-lovely and tattered awnings that peek in from the outside at the top of the windows (I am sure they were great when they were first installed, but right now they’re looking a little sad). Visitors to the designer house will enter my space from this direction after leaving the kitchen. Often I see full-length, gauzy drapery panels in sunrooms similar to mine. I love that look, don’t you? It’s so wispy and elegant…and would look great with my antiques, etc. But you’ll remember there is a 10″ high ledge that runs all around the perimeter at the base of the windows, and there’s a baseboard heater beneath that too. Plus, full-length draperies wouldn’t do anything to hide the tattered green awnings outside. This sunroom I found on Pinterest has beautiful gauzy draperies…I love the romantic feel! I decided in my room I wanted something light, simple, and elegant, but with some pretty details. I found an image on Pinterest I liked, but even this is a little too formal for my space. These ivory valances with green banding are so pretty and elegant in this sunroom. I’m thinking of doing something similar in my designer house sunroom. I decided that instead of board-mounting my valances, like the ones pictured above, I would like to use a pleat, spaced very far apart with a flat panel spanning two windows each. Allowing a little ‘give’ between the pinched-pleats will create a very soft, loose buckle in the flat panel (not a horizontal pleat) for a soft-flowy look. 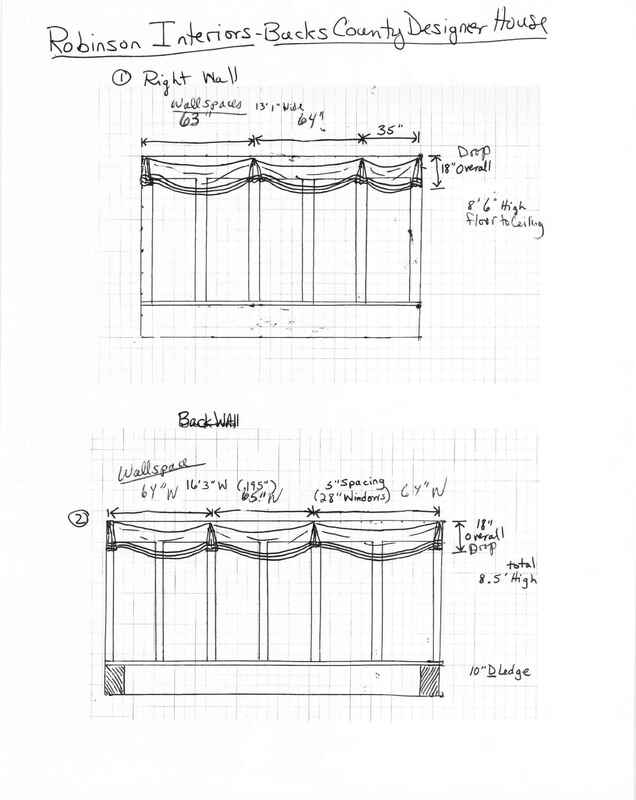 These are workroom specifications for my Bucks County Designer House Sunroom valances. They will have a very loose, unstructured feel. A sparkly, starburst medallion with a tassel will be applied at each pleat, and beautiful velvet ribbon with salmon gimp/braid will be applied 1″ up from the hem. 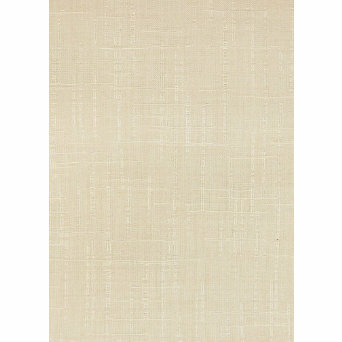 I purchased a beautiful ivory Sunbrella fabric that has a linen texture. I’m going to have the treatments self-lined to give them body. An ivory Sunbrella fabric with linen texture will be the main fabric for my Bucks County Designer House Sunroom Valances. Then, to add some detail, I purchased beautiful 1.5″ wide velvet ribbon in a wonderful camel-gold color (it will look beautiful with the rug). The workroom will stitch the ribbon down the center and apply it 1″ from the hem. On top of the stitching, I will have them apply a salmon gimp/braid for a layered look. The finishing touch will be these wonderful be-jeweled starburst medallions and salmon tassels which match the gimp/braid. Aren’t they wonderful?! A snapshot of the starburst medallions, tassels and trim that will be on the ivory Sunbrella fabric for my Bucks County Designer House valances. Finally, since the single door has 2 stationary windows on either side, I’ve decided to do a pair of coral linen drapery panels. I’m using the same exact linen that’s on the tufted settee on the opposite side of the room. So they should balance each other beautifully. I plan to do them tied back, on either side, with one of the sparkly medallions. The stationary windows on either side of the door will get beautiful full-length coral draperies, to frame the view. Grace Irene Window Fashions, whom I’ve partnered with on previous designer houses, is graciously providing all my drapery labor. http://www.graceirene.com/ She and her staff provide impeccable workmanship and create truly beautiful soft treatments. They make everything to my exact specifications and I’m confident the results will be spectacular…I’m so excited!! Window Treatments are incredibly important to any interior. They soften the hard surfaces, draw the eye upward, frame out the view, and add color and texture…providing tremendous impact on a room’s ambiance! Make sure you take the time to post a comment and let me know what you think about my latest plans for this room. I LOVE to hear from you! And please, tell everyone about Kristine Robinson’s blog. I need all the friends I can get! 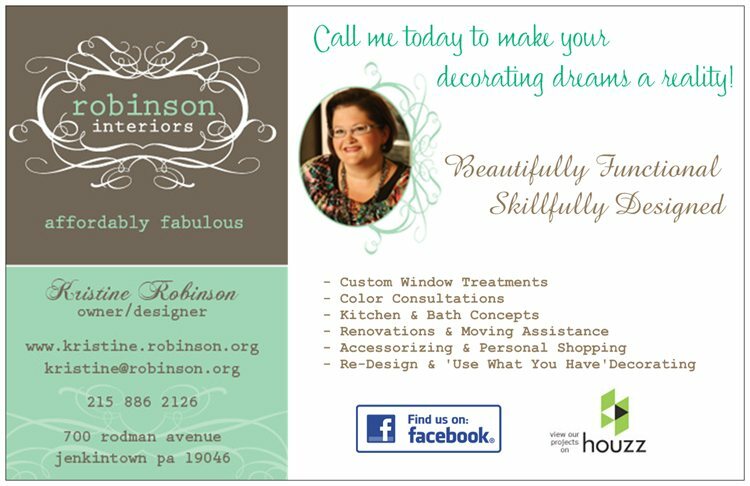 This entry was posted in Bucks County, Designer House, Draperies, Interior Design, Window Treatments and tagged Bucks County Designer House, Decor, Decorating, Fabric, Interior, Interior Decorating, Interiors, Robinson interiors, Windows. Bookmark the permalink. Beautiful Kristine! And interesting point about the panels and the baseboard heat source. And did you choose a Sunbrella fabric to resist fading since this is a sunroom? Thanks, Holly. Yes, I did choose Sunbrella, partly to resist fading (this sunroom gets a lot of natural light), but I also just liked the look and simplicity of the ivory-linen texture. As always, it’s great to hear from you!! Thanks for commenting. Thanks for posting. 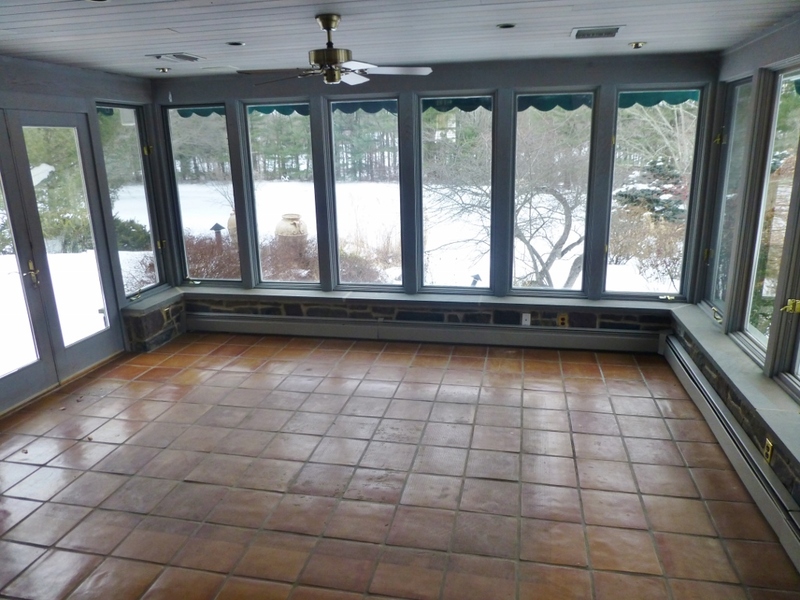 The sunroom on this house was already built before I got there…it’s a beautiful room with a solid tiled floor, stone-work, and a lovely standing-seam roof on the outside. I love having a beautiful view of the grounds on all 3 sides! !